In the heavyweight division today there seems to be a focus on who hits the hardest as if that’s the be-all end-all. And that probably has mostly to do with the two title holders, Anthony Joshua 21-0 (20) and Deontay Wilder 40-0 (39), who both have impressive knockout percentages. Wilder’s is an astounding .975 and Joshua’s is right there at .952 and if they never fought again they’d retire one and two in the division’s history. For context, George Foreman, who I believe is the single biggest one-punch banger in history, KO’d 68 of the 76 fighters he defeated and boasts a .894 knockout percentage. When it comes to measuring power, it’s not how many opponents a fighter has stopped – the more important thing is who did they stop. For example, Foreman dropping and stopping an undefeated 29-year-old Joe Frazier in under five minutes, or Thomas Hearns stretching Roberto Duran for the count with one right hand in the second round. However, there are other indicators. 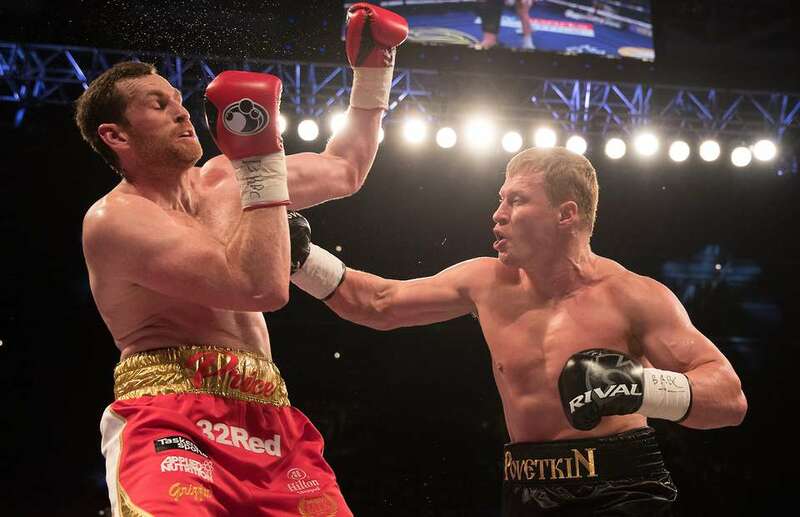 And we may see a perfect example of that when Alexander Povetkin (pictured in his most recent bout against David Price) challenges WBA/WBO/IBF title-holder Anthony Joshua this coming September 22nd. In the midst of chronicling previous bouts of Joshua and Wilder, it’s been said in this space that AJ possess short and inside power and Wilder doesn’t. In addition, it’s also been mentioned here that once Joshua plants his opponent with a good one, they look to get away or clinch, seldom answering right back or engaging with him. This isn’t the case with Wilder. He’s hit many opponents clean and they kept carrying the fight to him until he landed the perfect shot to get them out, something they didn’t fathom was a possibility after first sensing his strength and power earlier in the fight. Povetkin 34-1 (24) has never been stopped. In October of 2013 he fought Wladimir Klitschko who was the universally recognized top dog in the heavyweight division and in spite of being knocked down four times, he went the distance. Klitschko is without a morsel of doubt a bigger and more natural puncher than either Joshua or Wilder is or ever will be. Making Povetkin’s feat of going the distance all that more impressive is that he did so while bringing the fight to Wladimir, something Klitschko no doubt relished as he didn’t have to seek out Povetkin and chase him around the ring. The last thing you ever want to do is bring the fight to a puncher, which is considered suicide, although some fighters because of their lack of height and reach have no choice if they want to win. And that’s the position Povetkin is in against Joshua. Stylistically, AJ — much the same way as Lennox Lewis and Wladimir Klitschko – is not a guy who you want to bring the fight to. However, for Povetkin to have half a chance, he can’t fight AJ from mid-range or outside. No, he must get inside to be remotely successful. With Povetkin knowing that this is without a doubt his last title shot, he has no choice other than to empty the wagon. If he moves away from AJ and deals with him the same way Joseph Parker did, he’ll lose every round just as Parker did. The ground rules of the fight will be established early. Hopefully, Team Povetkin realizes that if they can get AJ to move back, he won’t be nearly as effective nor will he be able to crack as hard. The one thing Povetkin will have to be cognizant of if he gets inside on Joshua is AJ’s right uppercut. Then again, if he can crowd him enough he can cuff and smother it some. To help him prepare for Joshua, Povetkin has brought in up-and-coming heavyweight Daniel Dubois 8-0 (8) to spar with. Dubois has hands the size of a lunch box and based on the effect they’ve had on his opponents thus far, they land with the impact of a brick. Once Dubois gets a little more experience he’s going to really be dangerous. After only eight bouts he may even be a little further along than Joshua was at the same juncture of his career. So it’s obvious Povetkin is using Dubois to get accustomed to a heavy-handed guy who is capable of doing damage with anything he gets through with or lands clean. And that’s why I’m so intrigued to see if Povetkin really will carry the fight to AJ. If Povetkin, after feeling Joshua’s strength and power, is fighting on his back foot by the end of the first round – to me that’ll be a red flag and for him a white flag, as in a white flag of surrender. Also, if he refuses to engage AJ or answer his lead shots and only punches when it’s safe, that will be an indicator of AJ’s strength and power. But if Povetkin stays in range and fires back while he’s still in the danger zone, he’ll have a better chance to win and it may be an indicator that AJ isn’t quite the killer that his .952 KO ratio projects.